Can we Stop Doctor Shopping? This is a prospective study designed to compare the outcome of two different lines of medical therapy for Benign Prostatic Hyperplasia (BPH), namely:  blockers alone versus  blockers and androgen suppressors in combination. One hundred patients were included in the study, which was conducted during the period from September 1998 to March 2001. Detailed history was taken with thorough physical examination and investigations. Patients also underwent ultrasonography and intravenous urography to assess the upper tract function and postvoiding residual volume. The American Uorological Association (AUA) Symptom Score, urinary flow rate and the volume of residual urine were assessed in all patients and were used for comparison. The patients were randomized into two equal groups, each consisting of 50 patients. Those in group I were given Doxazosin (4 mg/day) alone while those in group II were given a combination of Doxazosin (4 mg/day) and Finasteride (5 mg/day). It is concluded that the results obtained with combination therapy are more promising and significantly better than those obtained with a single agent. All the parameters of comparison, i.e. the AUA score, urinary flow rate and volume of residual urine, improve with both methods but to a much greater extent in group II, the combination therapy group. Day Case Adenotonsillectomy: Is it Safe? Is a Hand Scrub by Soap and Water or by Betadine Mandatory before Surgery? One thousand two hundred and forty swabs were taken from hands of surgeons and assistants in different theaters after vigorous scrubbing by brush with soap and water alone or betadine (as disinfectant). All swabs were cultured to assess for microorganism contamination. The study showed that there was no much difference between those three methods of disinfection after 3 minutes scrubbing. Data were analyzed statistically using Chi-square test. The calculated statistical values were tested on the level of significance of (p<0.05). The study was designed to see the effect of diazepam 0.2mg/kg I.V. before the usual induction dose of ketamine 2 mg/kg I.V. on the cardiovascular parameters (heart rate, diastolic and systolic blood pressures). Eighty patients were scheduled for elective surgery allocated in two groups: [group A: (n=40) received ketamine 2mg.kg IV and cardiovascular parameters were measured], and [group B: (n=40) diazepam 0.2mg/kg I.V. preceded ketamine by 5 minutes and cardiovascular parameters were measured]. Group A showed a significant increase in (heart rate and blood pressure) on test period. In group B: there is a significant decrease in (heart and blood pressure). The study support the idea that diazepam is effective in reducing cardiovascular effects of ketamine to make smooth induction of anaesthesia. 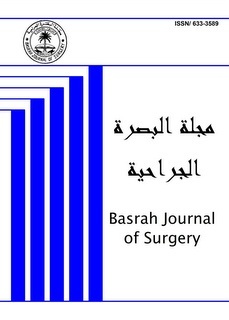 Three patients with upper gastro intestinal (UGI) bleeding have been admitted to Baghdad Teaching Hospital over the period from 1999-2002. The first patient was a 35-year old female with recurrent UGI bleeding; the investigations and operative findings proved that the cause of bleeding was due to false aneurysm of the splenic artery communicating with the pancreatic ducts. The second patient was a 70-year old male, the cause of the attacks of bleeding was due to malignant endocrinal tumor of the head of pancreas eroding the duodenum. The third patient was a 65-year old female with gastric perforation and bleeding due to tuberculosis of stomach as shown by histopathology results.